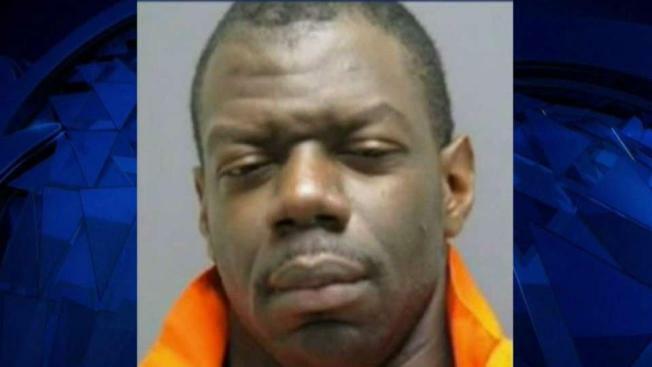 The man accused of killing a Virginia police officer and his wife stood trial Tuesday. Ronald Hamilton's lawyers did not dispute that he committed the killings but said they were not premediated. News4's Chris Gordon reports. Prosecutors say an Army staff sergeant killed his wife and then shot at officers, killing one and injuring two. Officer Ashley Guindon was killed on her first day on the job. She was 28. Victim Crystal Hamilton's sister said she hoped her family's loss would spark a conversation about domestic violence. Jurors heard opening statements Tuesday in the death-penalty trial of an Army staff sergeant charged with killing his wife and a police officer who responded to their home on her first day on the job. Staff Sgt. Ronald Hamilton is charged with capital murder in the shooting deaths of his wife, Crystal Hamilton, 29, and Prince William County Officer Ashley Guindon, 28. Two other officers were seriously injured in the Feb. 27, 2016, shooting in Woodbridge, Virginia. During opening statements Tuesday, prosecutors played Hamilton's 911 call, when she pleaded for help before she was shot three times. She said her husband threw her against a wall, hitting her head. Prince William County Police are mourning the loss of Officer Ashley Guindon. News4's Julie Carey reports. Defense lawyers do not dispute that Ronald Hamilton committed the shootings but deny he acted in a premeditated manner. They said he and his wife argued when he objected to her plans to attend a male dance revue with friends. Their marriage was in trouble and they each were having extramarital affairs, lawyers said. When Crystal Hamilton threatened to call police, Ronald Hamilton realized he would lose his family and military career. He snapped and opened fire multiple times. But then he confessed, attorneys said. "Ronnie throws his gun down. He turns himself in. He admits what he did," an attorney said. Ronald Hamilton wore his dress uniform in court. Prosecutors criticized that choice. "This man who presents himself to you in the uniform of a protector, he was anything but," an attorney said. Guindon and Crystal Hamilton were killed on the Hamiltons' son's 11th birthday. He was home during the killings. Ronald Hamilton cried in court when a statement was read from his son, who is now 13 and living with an aunt in South Carolina. In the statement, he said he heard his parents yelling. His father got a gun, followed his mother into a bedroom and shut the door, he said. "I heard three shots," the child said. Officer David McKeown, then 33, and Officer Jesse Hempen, then 31, were injured in the melee. Investigators found 39 shell casings. Ronald Hamilton was assigned to the Joint Staff Support Center at the Pentagon, according to Cindy Your, a Defense Information Systems Agency spokeswoman based at Fort Meade, Maryland. Guindon was sworn in as an officer on Feb. 26, 2016. She was on her first shift when she was shot. 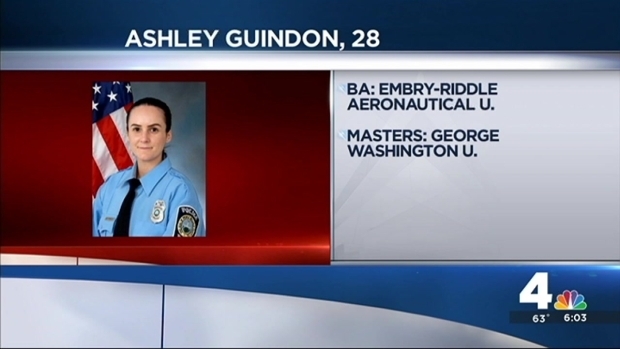 According to a police press release from June 2015, when Guindon graduated from basic recruit school, she was a graduate of Embry Riddle Aeronautical University in Daytona Beach, Fla.
News4's Darcy Spencer reports from a vigil in Woodbridge, Virginia, for Prince William County Police Officer Ashley Guindon. The officer was killed in the line of duty while responding to a domestic dispute Saturday. She served in the U.S. Marine Corps Reserve and had family in law enforcement, the release said. 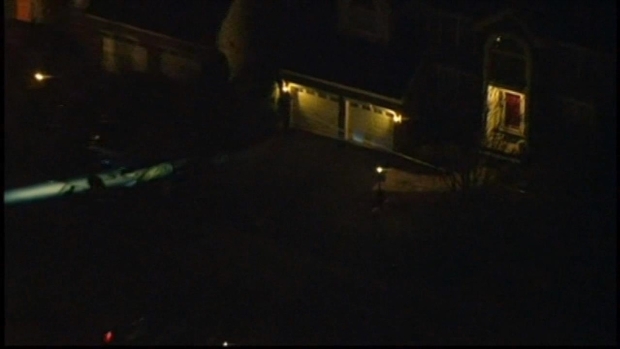 The shooting occurred around 5:30 p.m. in the 13000 block of Lashmere Court in Woodbridge. Neighbors reported hearing several rapid gunshots ring out as young people played outside. "We heard three to four gunshots, so we started running, and then when we got up here we saw all the cops," said one young witness, who asked not to be identified. "They told us to go inside." "I can't believe this is my neighborhood," said neighbor Saher Jan. "I was just in front of that house. I just couldn't imagine that it happened right there. They seemed like nice people." Police said the officers were fired upon after responding to a domestic disturbance call. After other officers arrived, Hamilton surrendered to police. The three officers who were shot were transported to Inova Hospital. Guindon died during treatment. Officers found the body of Crystal Hamilton inside the home. The couple's 11-year-old son was not injured. As Guindon was sworn in, Prince William County police tweeted a message of welcome to her and another new officer. Featuring a photo of the two rookies in uniform, the tweet read, "Be safe!" Ashley Guindon's grandmother, Dorothy Guindon, said Guindon was born in Springfield, Massachusetts. The family later moved to Merrimack, New Hampshire. Crystal Hamilton worked as a counselor to military veterans. She was vivacious, dedicated and hopeful, her sister, Wendy Howard, said. Wendy Howard said she hoped her sister's death would start a conversation about domestic violence. "I see this as being an opportunity ... a platform for other women being battered, who are experiencing either mental abuse, physical, verbal emotional to come forward," she said. "This is your opportunity. Don't hide it from your family. Don't hide it from your friends. If you know of people going through the same thing that my sister, I'm sure, was going through and never said anything about it — don't be afraid. This is your opportunity." "If you don't get out for yourself, get out for your kids, get out for your family," Wendy Howard added. A Prince William County Police Officer was shot and killed -- and two others were hurt -- when they responded to a domestic shooting report in Woodbridge, Virginia. News4's Darcy Spencer and Julie Carey report.